One of the things that keeps most people from trying out fly fishing is the common impression that it is too complicated, and too expensive. And if we look at the range of options in equipment and techniques, and considering all of the possible locations and species there are to fish for around the world, it's easy to see why people might feel that way. You can readily spend thousands of dollars just to get outfitted with basic equipment. And some of the top shelf, worldly, destination fly fishing trips, all expenses considered, could easily eclipse some people's annual salaries. Yet according to one study, shared here by the American Fly Fishing Trade Association, there are almost 4 million fly anglers in America today. They can't all be millionaires! When I got into fly fishing it wasn't as complicated as it is today. I borrowed an old "Browning" fiberglass fly rod and Pflueger reel from a friend of mine, and I got a handful of flies and a few factory tapered leaders down at the fly shop, and I was all set. I was already a fisherman, I had been fishing all of my life by then, with bait and lures, spinning, trolling, etc. 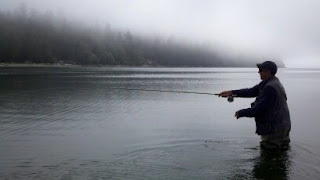 Up until my twenties, though, I had avoided fly fishing because, aside from the intimidation factors of casting, confusing flies etc., I didn't believe that I could afford it. I was just a carpenter. As a bait fishing friend once dryly observed, as a few fully appointed fly fishermen walked silently past us, on their way upstream on one opening day: "Were just ham and eggers, man." I guess that the curiosity just got the best of me at some point. Probably because I had seen plenty of fly fishermen on the New England and Catskill trout streams by the time I was in my 20's. I will admit that it was annoying to see that there were days when no manner of bait would turn a trout to feed, while the fellow who was dry fly fishing nearby was landing fish after fish. Often releasing the fish. All of that was intriguing, especially the fly casting. I just knew I had to do that, somehow. So I stumbled into it all, without much instruction or support. Backyard casting instructions at Pete's house would have to do. I guess it was good enough, as we had 20 years of opening days together after that. And even with a beginners cast, and a million lost flies and tangled leaders, we caught a lot of trout back then. They were hatchery Brown trout, and we ate most of them. Back then there were fewer kinds of rods available, mostly fiberglass or cane. Many of them were fairly affordable. Some were impossibly expensive. And only a few fly line designs were on the market, made by a handful of companies. Reels were anywhere from dirt cheap factory stamped, to jewel-like, hand crafted collectibles of unparalleled precision. (None of those were what anyone would call "affordable"). There were far fewer fly shops, and almost no bigger outlets at all, except for firms like Orvis, L.L. Bean, Eddie Bauer and Abercrombie & Fitch. Sometimes you had to wait a long time for your flies, or anything else. Mostly because there was often a lot of hand work involved. The whole game was considerably smaller and simpler in many ways. 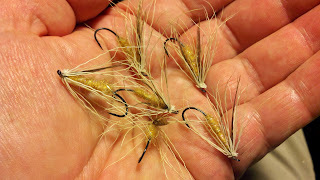 A few summer steelhead flies. Sea-run cutthroat trout like these too..
Fast forward to nearly forty years later, and things have changed considerably. There are hundreds of types of fly rods, reels, lines,etc. Many of the modern methods and materials used today are far superior to the older ones.Some aren't. The dizzying range of items, accessories, tools, clothing, gear, personal watercraft, etc., thousands of fly patterns!, is staggering. Not to mention the electronics. And the prices range form dirt cheap to out of this world. And if you were to collect all of the catalogs available for the fly fishing industry offerings, you would never leave your bathroom. It can be daunting for anyone new to all of this. But seriously, no matter what you think you can afford, if you are a "ham and egger" like me, or you are a corporate success with a plutonium credit card, don't be in a hurry. Go shopping but leave your money at home. 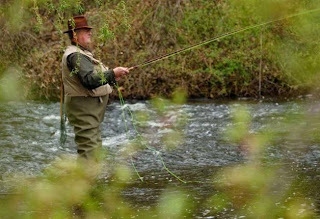 All of the better makers of fly rods and fly fishing tackle will offer an entry level fly fishing outfit. For the first few years that is all that you will need. Most fly shops will have these outfits in stock, including a fly rod, fly reel, fly line etc., the basic stuff you need to begin with. You can expect to spend anywhere from $100 to $250 for all of that. The better outfits will come with a warranty, and they will last your lifetime if you take care of them. The next thing that you do is to take a class in basic fly casting and fly fishing, which most better fly shops will offer, often at modest or no cost. Most fly fishing clubs, and some community colleges, will offer free or inexpensive classes. And even some of the Orvis shops will offer them free, like this: Orvis Fly fishing 101 After you get an introduction to the basic skill of fly fishing, you will have a clearer idea of what you might need to get into fly fishing your local waters on a regular basis. And you will have become more aware of the available waders, boots, minimal tools, packs etc., and the price range. A little education in the beginning will help you to have a much better experience, and possibly save you many hundreds, or even thousands of dollars of needless expense. It turns out that buying the best quality stuff that you can reasonably afford will actually save you money in the long run. It's all about longevity. The bare essentials of bliss. 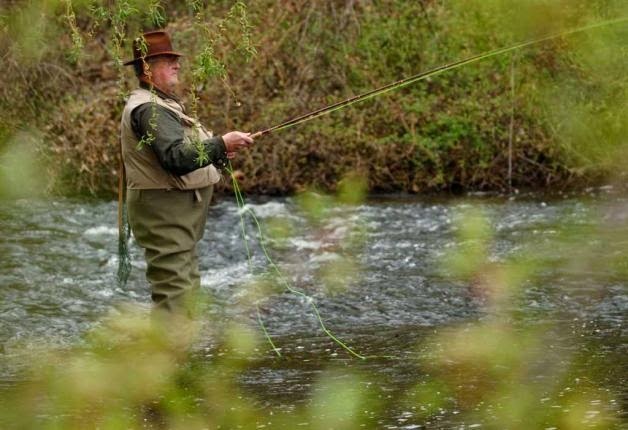 When you get to the point where you can go fly fishing with only what you need, no matter what the price tag might have been, and you can enjoy the simplicity of your time on the water, with a minimum of equipment, accessories, technology, techniques, worry etc., you will be on the right track. This is, after all, supposed to be an escape from the complexities of the modern world. One thing that I like to do every season is to go fishing on a small mountain stream in the summer, with just a few flies, a leader and a spool of tippet, a pair of forceps to remove the hook from the fish, and line nippers, my rod and reel, and a pair of boots. I just lazily splash along in the shallows, amid the boulders and rivulets and bright foaming currents, enjoying the cool water seeping into my boots, and on my legs, the insect hatches, the stream side foliage, the cooling shadows and dappling, dancing light on the water, and the pretty little wild trout that take my tiny dry flies. A peanut butter sandwich and cold drink of water will be just right. You might forget yourself, and all of your worries and stress. If you look at your watch hours later and feel surprised that time disappeared, and that the sun is setting, then you were doing it right. 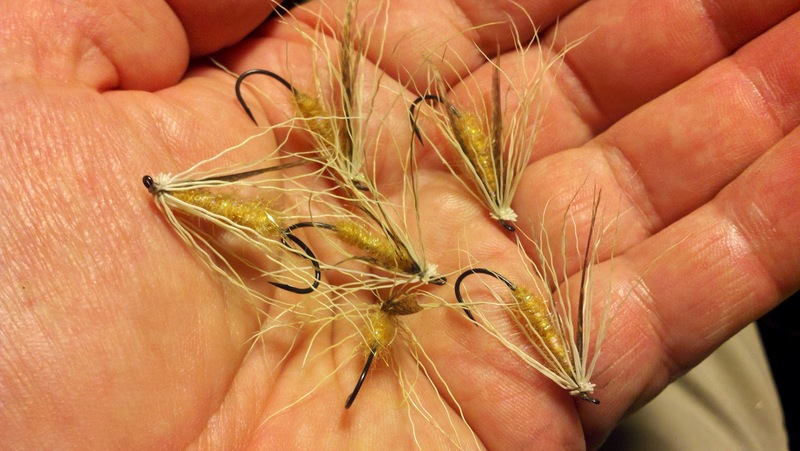 The Chum Baby fly, for Puget Sound sea-run cutthroat. On their way to the Orvis Bellevue fly shop this week! Spring sea-run coastal cutthroat trout fishing is coming! The summer and fall chum salmon and pink salmon spawned last fall, and their progeny are beginning to emerge from their shallow gravel nests in the Puget Sound regional rivers and streams now, and for the next few months or more ahead. Of course in many of these waters the coastal cutthroat trout will be spawning too. And then they will be feeding on these chum salmon fry. And as the salmon fry move into the estuaries, and eventually find their way into the greater currents, they will be migrating north out of the Puget Sound region, on their migration to the sea. The cutthroat trout will be following them, and feeding on them. April and May are prime time for this spring fishing in the saltchuck here in the northern waters. There's nothing like fishing over aggressively feeding wild cutthroat trout, casting flies from the beaches. The take is hard and fast. The fight is electrifying. You might even forget yourself. Be there.